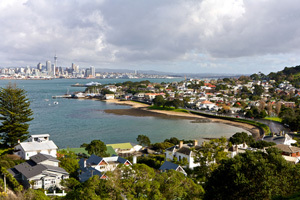 The median price of homes sold by Auckland's largest real estate agency hit an all time high in October. The median price of homes sold by Barfoot & Thompson was $655,000 in October, up $20,000, or 3%, from $635,000 in September and surpassing the previous all time high of $652,000 set in March this year. The median was $65,000, or 11%, lower at $590,000 in October last year. The average price of homes sold by Barfoots in October was $736,238, down a smidgen from the all time high of $738,876 set in September. However the number of homes the agency sold in October dropped by 20 to 939 from 959 in September, and was 264, or 22%, down from the 1,203 it sold in October last year, suggesting the market remains tight and buyers may have trouble finding a suitable property. Some relief on that front may be on the way with the number of new listings the agency received rising to 1,765 in October from 1,314 in September. But that was still substantially down on the 2,016 new listings Barfoots signed up in October last year. The total number of homes for sale on the agency's books increased marginally to 3,267 in October compared with 3,075 in September. That was also significantly below the 3,646 homes it had available for sale in October last year. Barfoot & Thompson managing director Peter Thompson said he expected the jump in the number of new listings to result in a significant lift in sales in November. Continuing interest in more expensive properties was a significant contributor to the average sale price remaining near its all time high, he said. The agency sold 169 properties for more than $1 million in October (18% of sales), while 238 properties, equivalent to a quarter of all sales, were for under $500,000, he said. No surprises there with the flowers in full bloom and the sun is smiling almost everyday. Good to see a property at the end of the street that was purchased for $1.2m last year and now in the market for over 2m. Milford? Sounds yuck! Is that on the other side of the bridge? Uh oh, all the crappy houses over winter have come and gone now the smart vendors with nicer houses are selling. Watch the capital gains over Spring / Summer . "Auckland house sales fell in October from the month earlier, as the number of unsold properties on Barfoot & Thompson's books rose to the highest level since July,"